Close. Convenient. 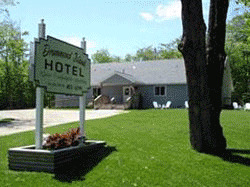 A stay at the Drummond Island Hotel means you are just a ‘stone’s throw away’ from the Four Corners – Drummond Island’s hub of activity. Need a bite to eat? Breakfast, Lunch and Dinner can be had at any number of excellent local establishments. From breakfast at the Island Bakery to Happy Hour drinks at the Northwood – you will never go hungry or thirsty on the Island! If it’s a new warm jacket your looking for or just the right bait for snagging the big one – you don’t have to wander too far from Drummond Island Hotel’s front door!